Will This Solar Stock End up Burning Investors? Is Hanwha SolarOne destined for greatness or infamy? One of the lesser-heard names around the water cooler when discussions turn to solar companies is Hanwha SolarOne (NASDAQ:HQCL). Are investors missing an opportunity here, or are they correct in focusing their attention elsewhere? Let's take a look. One promising factor for the company is its success in the Land of the Rising Sun. In 2013, Hanwha SolarOne saw module revenues from Japan improve from 34% in the second quarter to 46% in the third quarter. The company recognizes significant strategic value in Japan. In its most recent conference call, management acknowledged its attempt to "exploit first-mover advantage" in 2014. Japan is strongly vested in developing solar capacity as it looks to continue its recovery from the Fukushima disaster. In 2013, the country added 4 GWs of solar capacity, bringing its total to over 10 GW. The United States, China, Germany, and Italy are the only other countries to have reached that mark. Recognizing other opportunities for 2014, Hanwha SolarOne foresees the planned introduction of a Zep-compatible solar module in the early part of the year as a lucrative opportunity. The modules are perhaps most important for the company because they give it the chance to work with residential solar powerhouse, SolarCity (NASDAQ:SCTY.DL), which finalized its acquisition of Zep back in December. SolarCity estimates that it will install 278 MW in 2013, and it is guiding for a substantial increase in deployment for 2014 -- between 475 MW and 525 MW. SolarCity, which mitigates risk by purchasing PV modules from various companies, will be looking to purchase Zep-compatible modules in order to reduce installation time -- a major factor in determining the profitability of an installation. During the fourth quarter conference call, investors should certainly be on the lookout for references to the company's collaboration with SolarCity. Entering into several significant agreements, the company is starting the new year off right. For one, Hanwha SolarOne has reached a memorandum of understanding with OneRoof Energy to supply 50 MW of modules for the company's rooftop installations. In Q3 2013, Hanwha SolarOne shipped about 38 MW of modules to the U.S. Operating in Arizona, Hawaii, California, and Massachusetts. OneRoof Energy, like SolarCity, offers homeowners the opportunity to purchase the electricity produced from their rooftop panels for a fixed rate that is significantly lower than that of their local utility. The term of the solar lease is 25 years. Despite some promising signs, the company is facing multiple challenges. For one, its debt is growing at a substantially higher rate than its peers. In reference to the excessive debt, management stated that one of its goals for 2014 is "Attention to restructuring our balance sheets with less reliance on debt." If the company was seeing substantial growth, perhaps the increase in debt would be more tolerable; however, both the top line and bottom saw declines quarter over quarter. Revenues dropped 4% from $192.7 million to $185.5 million, and GAAP EPS decline from ($0.32) to ($0.89). 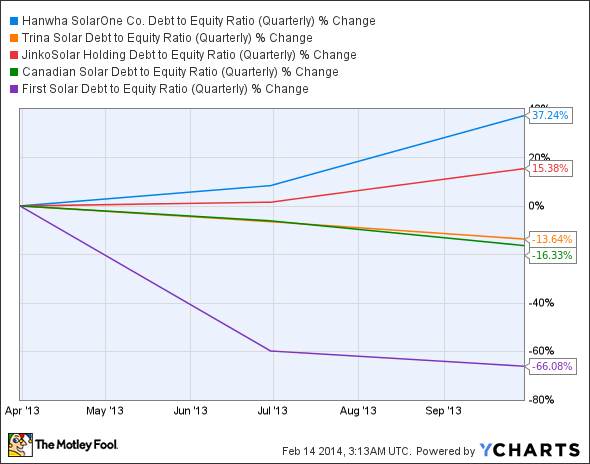 Increasing debt is not necessarily a bad thing in the world of PV manufacturers. Unlike Hanwha SolarOne, Jinko Solar (NYSE:JKS) made effective use of its increasing debt. For the same period, Jinko saw revenues rise 11.2% from $287.6 million to $320.7 million; diluted EPS doubled from $0.36 to $0.72. Margins are equally troubling for Hanwha SolarOne. Quarter-over-quarter gross margins dropped from 5.5% to 5.1% and operating margins dropped from 15.8% to 15.7%. Again, Jinko Solar demonstrated how to operate efficiently while managing debt -- its gross margins, for the same period, increased from 17.7% to 22.3% while operating margins increased from 8.8% to 12.4%. Although there are some positive takeaways for Hanwha SolarOne, many concerns exist regarding the company's performance. Investors had high hopes for the company's third quarter earnings last year; however, the company failed to deliver. Perhaps its fourth-quarter earnings will redeem the previous quarter's disappointment. Until then, interested investors should certainly dig deeper to see if this beleaguered company warrants investment.